Let’s face it. Most consumers don’t walk into your store to buy a pillow, a topper, mattress protector or sheets. They ask to test your mattresses or perhaps see the $599 advertised special. And most retail CSA’s are glad to oblige, happy to bring them to the bedding department and perhaps close a sale if the customer finds something agreeable. And by the way, it’s pretty easy to get customers to add an inexpensive mattress protector so the warranty /comfort guarantee isn’t voided. But is that good enough in today’s tough retail environment? The experts Furniture World interviewed for this article say, definitely not! In the first three installments of this “Selling Better Bedding” series that began with the April/May 2011 issue, Furniture World presented sales tools and merchandising techniques that the most successful bedding retailers use to make sure that their customers get the best mattress and the most comfortable night’s sleep they can afford. This time, we will begin to present ways to increase average tickets by working with customers to add items such as pillows, toppers, mattress protectors, sheets and foundations. The importance of paying attention to this aspect of your business cannot be overstated. That’s because retailers that fail to focus on these products, cede sales to big box stores and specialty web retailers. From a customer service standpoint, they also shortchange customers by not giving them the information and high quality products they deserve. And even for stores that have done a good job of selling premium mattresses at higher price points, there is no good reason to let customers walk out without presenting a complete sleep solution. There is a huge opportunity for furniture and mattress specialty stores that have knowledgeable salespeople and a smartly merchandised selection of top of bed products. Mass merchants simply do not offer the level of assistance that your customers need to put together a package of products that will give them peace of mind and a better night’s sleep. Your customers cannot test out a pillow, a topper or get anyone to explain the features, advantages or benefits of mattress accessories at big box stores. Plus, by offering a complete sleep solution you can save your customers time and trouble, a huge benefit you and your salespeople can feel good about. Retail customers who upgrade from full to queen, or queen to king already know that they need new sheets, and perhaps a new mattress pad. They may plan to make a quick trip to Walmart, Kohls, Target, or Bed Bath and Beyond after buying a mattress. Some plan to use the old top of bed items they have at home on their new mattress, and others haven’t given the subject much thought. But the fact is, that even with some training, many salespeople just don’t know how to effectively introduce and close on these products. They may feel that there just doesn’t seem to be a proper time to introduce these items without rushing or distracting customers from their mattress purchase, and they don’t want to seem overly pushy. “The mattress industry” says Michael Wright, Senior Territory Sales Trainer for Leggett & Platt, Inc., “sometimes has a stereotype of being a little pushy and customers have their guard up. Mattresses are sometimes a product that they price shop competitively for, so consumer’s main focus is getting a good mattress deal. Most stores really want to satisfy the customer with a mattress first, so these add on sales become a secondary consideration. 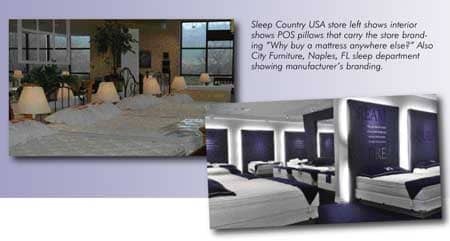 Sean Bergman, VP Sales and Marketing for Fabrictech, the manufacturer of health-focused mattress and pillow protectors, told Furniture World that, “in order to effectively sell pillows, mattress protectors, sheets and foundations, these items need to be seen by retailers as sleep essentials and not accessories. In fact, the term accessories is a bad word for me. I believe that our products are essential items to enhance the sleep environment. And that’s a mentality that retailers have to adopt if they want to increase business substantially without having one more customer walk in their door. But where should you start? Some of the industry experts Furniture World interviewed for this article advocate getting down to the business of showing products quickly. Others suggest taking time to get information from customers about their needs and the quality of their sleep. Whether time is invested in speaking about health and wellness first, or if customers are brought directly to top of bed products, our experts are in general agreement that the best time to introduce customers to a pillow is before mattress testing begins. “If you wait until the end”, warns Pure Latex BLISS’ Kurt Ling, “you have three or four extra things to sell them which can get overwhelming for the customer. It’s like buying a new car, sitting down at the credit manager’s desk as he or she tries to sell you 17 accessories and upgrades in a row. Some retailers emphasize the creation of a sleep sanctuary all at once. We’ve learned exactly the opposite because to the consumer, that can feel like the retailer is trying to sell them $1,500 worth of stuff after they’ve just spent $1,000 or more on a mattress. We totally believe that there is an appropriate time to introduce each element in the sale. “We found out that the best performers have a method. They don’t just throw all these products up against the wall. They introduce the pillow, topper and mattress protector at the right times. And their success is independent of the price point of the bed, and the income of the customer. They realize that if they show each of these things every single time, X-number of people will consistently buy. And this is true for retail furniture stores as well as sleep shops. Kurt makes an important point, because not only does using a pillow help customers to avoid choosing the wrong mattress, it also helps their delivered mattress feel the same as the one they tested in your store. Using a testing pillow may, therefore, result in fewer product returns. All of our experts noted, that not only is it worthwhile to suggest that customers choose a pillow at the start of the sales process, it is very easy to get them to pick one up and carry it around. “You really just need to ask them for permission to fit them for a pillow,” continues Kurt Ling. “It’s true that consumers may not be thinking about buying pillows when they enter your store, but if you let them know that a pillow and mattress go together, then most people will give you permission, even if they’ve never bought a pillow and mattress together before. “The first thing we do,” agrees Leggett & Platt’s Michael Wright, “is to have the customer select a pillow. It’s all about a good night’s sleep. One way to language this is to say, ‘Before we start looking at the beds today, let’s go and get a pillow, something that you might want to be sleeping on, or something similar to what you are sleeping on at home right now, and we are going to take that to every bed so you can really get a good idea of how each mattress is going to feel in your home. A pillow is the bed for the head. Over 25% of your body is going to be touching that pillow, so it’s really important to get a good one when we are testing out mattresses.’ You might also say, ‘you probably haven’t thought a lot about your pillow in a while. A lot has changed. You will probably be able to get a better night’s sleep with a new pillow.’ It’s the salesperson’s job to not just sell something, but improve the quality of their customer’s sleep. And if they can convey that message, customers purchase. Michael’s brief mention in the previous paragraph about a “personal pillowcase” is not one that should be overlooked. Although it is true that not every customer will wonder how many other heads have touched the same pillow they are using, many will. So why not take away this potential worry? Why allow even passing images of poor sanitation to distract customers? By having a supply of freshly washed or disposable pillowcases handy, and making a show of putting on a fresh case, you let customers know that you care about their concerns, and their health. "Sealy's research shows that a significant percentage of consumers, particularly women, are uncomfortable with putting their heads on an in-store pillow while testing floor models,” confirms Jodi Allen, Chief Marketing Officer at Sealy. “We addressed this hygiene concern by offering pillow protectors. The more we can create a positive, inviting shopping atmosphere and speak to consumers in relatable language, the more likely they will take the time to find the mattress that truly fits their comfort preferences and needs. This leads to both higher satisfaction and bigger ticket sales." “So the salesperson gives them a nice pillow,” continues Michael Wright, “and isn’t trying to close the pillow sale yet, he or she is just giving the customer tools needed to pick out the right mattress. They are recreating the sleep experience, and in so doing, indirectly selling the pillow. “What customers don’t know at this point, is that after they pick out a mattress, the salesperson will bring them back to talk about all the other things that will help them get a good night’s sleep. After you’ve sold a mattress, you don’t want to tank a mattress sale by pushing too many additional products. What you need to do is introduce customers to products in a pleasing and organized way so that they will want to buy -- not have to buy. Kurt Ling suggests a slightly different approach. “Because there is such a broad assortment of pillows today,” he says, “Most people have a pillow that is worn out, and even though they’ve probably replaced their pillow since they purchased their last mattress, they really don’t know what’s available. If you tell them what is available, it’s amazing how many people will ask to be shown. If the customer is using a pillow that is 5 to 10 years old, she probably doesn’t have a $199 contour pillow. So if salespeople only try to replace what customers have, they will tend to undersell. But if they tell their customers what’s available in the market today, and let them choose by saying, ‘We offer these, what are you interested in?’ it’s interesting to see how many people will take the time to compare. And then it’s a conversation on the customer’s terms, instead of just trying to sell them something new. Our experts suggest that display pillows carrying manufacturers’ and retailer’s branding be removed before mattresses are tested. Michael Wright agrees. “There are point-of-sale bolsters on mattress displays designed to look aesthetically pleasing,” he says, “and they work for the design of the stores and reflect the branding of the lines stores carry. Stores are selling mattress first and pillows as an add-on, so we don’t want to complicate that, but it is important to pull off the display pillow to allow customers to experience maximum comfort. Even if I were the mattress manufacturer, I would want customers to test out my mattresses with a nice pillow because the experience is better. “There are some stores that carry 40 pillows and in my mind that complicates it for the store, the salesperson and the customer, says Ralph Rossdeutscher. “We encourage retailers to initially provide four different pillow feels, and explain each of them. Typically the consumer will be drawn to one of them. They can then offer a few different pillows having a similar feel to the customer’s initial choice, but at different price points, thicknesses and materials. Michael Wright told Furniture World that, “retailers should offer a traditional pillow, a latex pillow and maybe a synthetic. They should have a broad selection. The secret is to not overload the consumer when they come in to look for a mattress with too many choices and too many pillows. I call it a pillow pause. Many retailers end up giving away pillows. It’s a way for them to throw in a little extra value, or to provide some consolation to customers who are disappointed that they can’t extract a discount on the mattress they’ve chosen. Some customers also remember that they received a free pillow the last time they purchased a mattress, and see no harm in asking for one again. Commenting on this practice, Pure Latex BLISS’ Kurt Ling explains that, “We think that the worst thing that a retailer can do is give away something after the customer has given clear body language that they are going to buy. All the salesperson needs to do is watch the body language of the person they just helped to select a pillow, and carry it around the store. If the customer holds it by the top, it basically means that they don’t care about the pillow and have agreed to carry it because the salesperson asked them to. If they carry it like a baby or hug it, it’s a clear signal that they are actually going to buy. Many customers can be persuaded to purchase a mattress protector at the end of the sales process if the salesperson says something like, “to avoid voiding your warranty, you will need to put your mattress in a mattress protector. We have one that costs $49 and one that costs $99. The $99 one gives a higher level of protection.” At this point, the consumer may be thinking. “I can probably buy one cheaper down the street at that big box store,” or “this is just another way to get $100 bucks from me by threatening to take away my warranty; something I deserve to have after paying $1,500 for this mattress.” This last minute offer can, therefore, be something that has the potential to negatively affect the customer’s perception of the salesperson and the store. 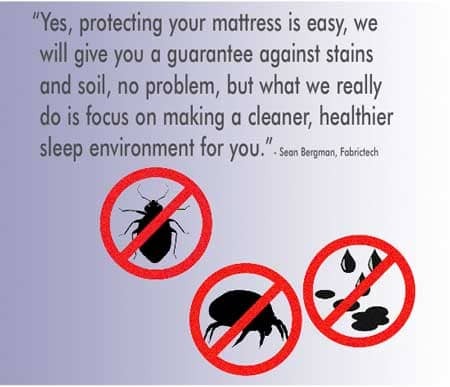 Fortunately there is a lot more that you can do throughout the sales process to let customers know why purchasing better mattress protection from you provides benefits they will want to take advantage of. Just as there is agreement that the pillow should be introduced before customers comfort test your mattresses, there is also a consensus among the experts interviewed for this article that timing the introduction of mattress protection is important. When customers get home, chances are that they will rip open the protector packaging and throw it away with the care instructions. Then just before they put it on the mattress they may realize that they bought something they know relatively little about. Will it fit so loosely that it wrinkles on the top? Does it feel like vinyl or cotton? If it is a total encasement they bought to keep bedbugs out, what will happen if they remove the cover to wash it? Will it be sturdy enough to resist tearing when they put it on a heavy, bulky mattress? Will it limit the temperature sensing properties of memory foam? Will it change the feel of the mattress? Can it be machine washed and dried without affecting its properties and the warranty? Should it be washed on cold or hot settings? Will they still need to put their old, fitted cotton pad over the mattress protector? Did they make a big mistake buying this thing? Mattress depth is an important consideration to consider. “A number of mattress encasement providers offer several depths for their encasements to fit 9” to 22” inch mattresses,” adds Bell, “so salespeople need to make sure that customers are purchasing the correct depth. Furniture World was also told that to ensure retail success, it is vitally important to have store management involved in setting up a program, creating incentives for sales associates, and monitoring it’s progress. “One of the key elements to having a successful mattress protection program,” Jared Bell said with regard to management involvement, “is to manage the process. It is important to set targets each month for selling mattress protection and the effort should be pushed down from the CEO, all the way to the sales associates on the floor. Salespeople should be presented with a target mattress protection attachment rate and profitability dollars they have to reach. When management doesn’t provide those numbers to sales associates, it sends the message that this aspect of the business really isn’t important to them. Then, if it’s allowed, salespeople may use mattress protectors as a closing technique -- as a give away to sell the mattress. Some retailers haven’t yet realized that mattress protection is a viable and profitable category for them, but the second management gets involved setting sales goals and targets, that’s when sales take off. The number of manufacturers selling power foundations has increased dramatically in the past two years. The category has made the quantum leap from being marketed to an older, infirm population to a luxury product that adds substantially to the comfort and functionality of the mattress. Power foundations are big-ticket items, and like a pillow or mattress protector, most customers don’t consider purchasing one before they are introduced to their features and benefits in a store. Using appropriate qualifying techniques to collect information from customers early in the sales process. Knowing what to say to get customers to demo and become excited about the purchase of a power foundation. Learning techniques to make sure that customers seamlessly choose a compatible mattress. Following up with customers who have an interest, but aren’t ready to buy a power foundation for their new mattress right away. In the March/April edition of Furniture World, this series will continue with a look at these and other techniques for presenting power foundations and better stationary bed frames.